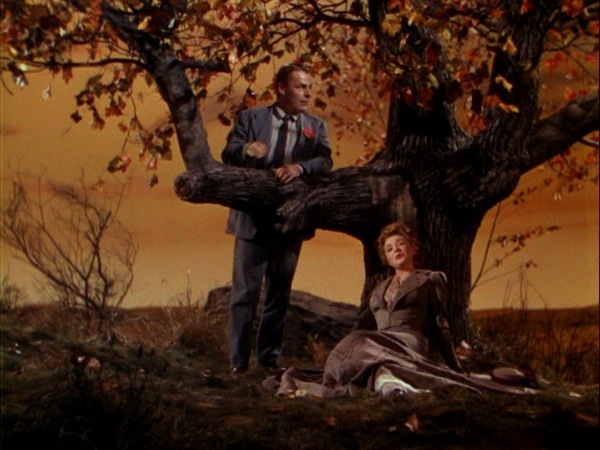 An American Romance is a little-known and remembered film from King Vidor, for whom the film appears to be a passion project. He not only directed it but produced and came up with the original story. 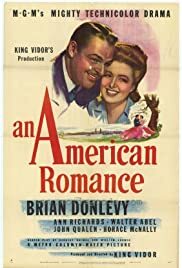 An American Romance is a fitting title for it, as it is a love letter to the immigrant experience, where steel becomes both the subject and emblem of the growing and strong nation. Patriotic at a time when films were more overt about supporting the war effort, An American Romance is not perfect, but pleasant enough. Narrated in voiceover, we learn the story of an immigrant from Europe, Stefan Dubecheck. He comes from 'the old country' and after essentially forcing his way through Ellis Island, he walks all the way to Minnesota to work alongside his cousin Anton (John Qualen) in the mines. Now named Steve Dangos (Brian Donlevy), he is fascinated by America. He earns six dollars a week, which to him is a fortune. He marvels that on July 4th, the company closes and that there is free beer and a picnic, even a raucous baseball game. Steve, however, thirsts for knowledge, and for that he turns to Miss Anna O"Rourke (Ann Richards). The daughter of a fellow worker, she's a schoolteacher who eventually falls in love with him. She, however, pushes him to further himself. Steve does this by going to further into steel, as he is fascinated by the metal. Starting at the bottom, he works his way up, and Anna, now married to him, starts having children. The patriotic Steve names his sons after George Washington, Thomas Jefferson, Abraham Lincoln and Theodore Roosevelt, the last one serving as narrator. Eventually, Steve and Anna endure the death of a son in World War I and Steve's partnership with a schoolteacher, Harold Clinton (Walter Abel), both who become fascinated with making a car. The company they form creates a safe car, the Danton (a combination of Dangos and Clinton), and the film ends with a semi-retired Dangos working furiously to make planes at a high rate of speed for the war effort. An American Romance has its positives. Of particular note is the semi-documentary feel when it comes to the making of steel, which I think serves as a symbol of the United States and Steve Dangos. It's a raw material that is shaped by fire and hard work to become something strong and powerful. Granted, perhaps I am putting too much subtext where there is none, but that's how it worked for me. An American Romance is also not afraid of being a bit lighthearted and playful. One such sequence is when George is going to graduate, a point of pride for the relatively uneducated Steve, who was taught to read by Anna. Whether it's his mad dash to fix his new car as his family is forced to walk there or the musical recital consisting of a very insecure girl singer accompanied by his semi-talented violinist son Abe, the moment is charming and sweet. This does not take away from the unabashed patriotism An American Romance has, for George gives a strong speech remarking how he and his classmates, sons and daughters of immigrants, owe a great debt to this land. The pride Steve has cannot be hidden. The scene where Anna has to tell him of George's death just before he goes to keep his promise to his beloved 'Georgie' to finally become a citizen is quite moving. Performance-wise, I think Dunlevy handled himself well as the eager, at times naive and innocent Steve. Given he was primarily known for tough-guy roles, Dunlevy showed he could play soft, even slightly comic characters, albeit at times his native American accent slipped through his somewhat undefined foreign accent. I genuinely could never decide whether he was meant to be Czech or Scandinavian. Richards too was good as the American schoolteacher. I would argue the script gave her little apart from the eternally supportive wife and at times she was a bit too dramatic for my tastes, but on the whole I think she acquitted herself well. Again, the script did make their romance surprisingly rushed, but given that from what I understand a lot was cut out of the original director's version, I can be a bit forgiving. An American Romance is also not afraid to show Steve in a negative light, as when he finds himself at odds with Teddy (Horace McNally) over the unionization of the Dalton Car Company. It also seems genuinely disinterested in some of the Dangos children. 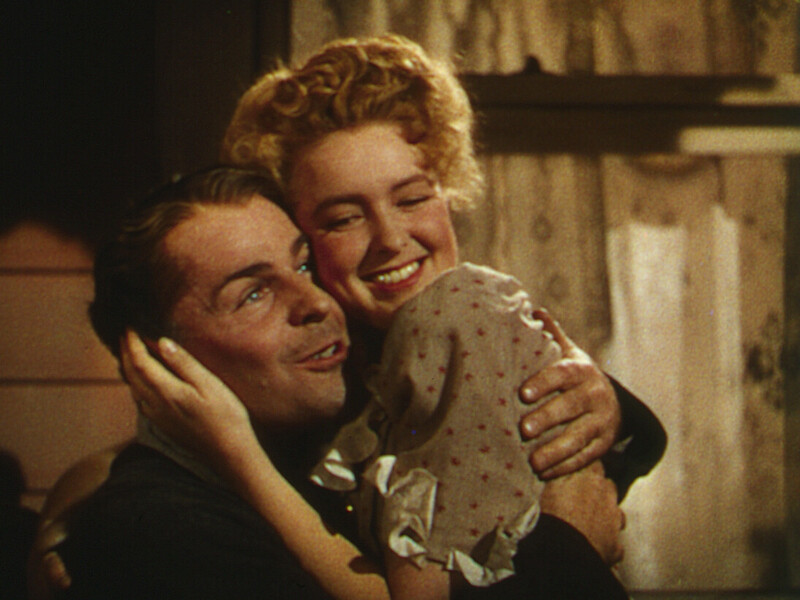 His only daughter, Tina (Mary McLeod) quickly disappears once she gets her father's consent to marry her beau and both Tom and Abe disappear too. It would have been nice to have seen more of Stefan's experiences on Ellis Island, especially when he's very temporarily placed with a group that will be sent back before he forces his way out. The immigrant experience would have been nice to have seen, as would his relationship with his family. However, for what we have An American Romance seems an apt title. It's a 'romance' between the immigrant Steve and the American-born Anna, which results in more American children. It's a 'romance' between a newcomer and his adopted homeland, of which he is fascinated and passionate about. It's a 'romance' between America itself and its drive to create, with again steel being the symbol of this great nation. It's not perfect and at times it seems to be almost a drag, but on the whole An American Romance is worth a look, especially if you have a living relative who is a naturalized American, to appreciate the struggles and fascination of a country we think we native-born know by heart.